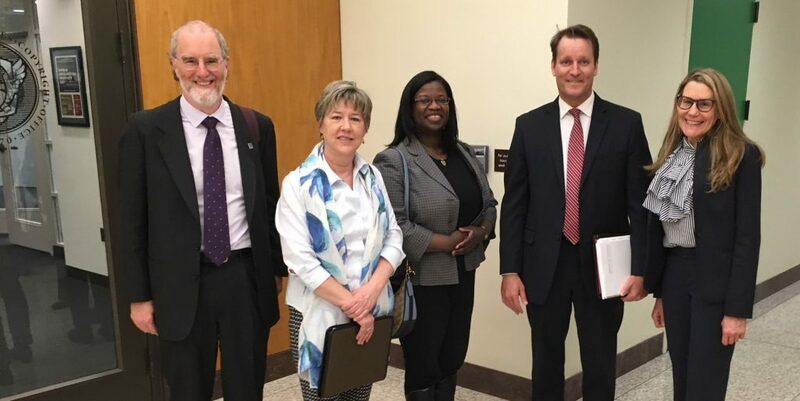 At the US Copyright Office, May 8, 2018 (L to R): Edward Hasbrouck (NWU), Tam Harbert (ASJA), Cheryl Davis (Authors Guild), David Christopher (Chief of Operations, US Copyright Office), Mary Rasenberger (Authors Guild). Photo by Michael Capobianco (SFWA). Washington, DC, May 8, 2018 — Representatives of the NWU, the Science Fiction and Fantasy Writers of America (SFWA), the American Society of Journalists and Authors (ASJA), and the Authors Guild (AG) converged on Washington this week to call on the US Copyright Office to create a “group registration” procedure by which a writer could register copyright in multiple short written “works” — articles, poems, flash fiction, blog posts, Web updates, modular textbook elements, etc. — for a single fee with a single form. We met in person with senior staff of the Copyright Office including the director of registration policy and the general counsel who oversees all rule-making, and asked that group registration be available regardless of whether the individual works are considered to have been “published” or are part of a “periodical.” These are arcane technical definitions about which writers have to guess, especially with respect to material that is distributed (but is it considered to have been “published”?) on the World Wide Web. Under current Copyright Office rules, only works first published on the same date, or as part of a “periodical”, are eligible for group registration. For other types of short-form works or works published as short modules or content elements, a writer has to submit a separate form and pay a separate fee for each day’s new work. If you post multiple articles, stories, or comments, or make daily updates, to a Web site or blog or on social media, you would have to fill out a separate form and pay a $65 fee every day to register copyright in your new work, for an annual total of more than $20,000 in fees. If you don’t register copyright in your new work within 90 days of its first publication, you can’t recover your attorney’s fees even if you sue a copyright infringer and win. Legal fees for a copyright infringement lawsuit typically costs tens or hundreds of thousands of dollars. So without the ability to recover these fees if the lawsuit is successful, suing an infringer isn’t a realistic option. Because of the cost of registering digital and other “granular”, modular, or dynamic short-form content under these rules, almost all Web content is unregistered and lacks effective protection against infringement. A fee of $20,000 a year to register copyright in a Web site is simply unconscionable. It’s not fair to require witers to register our works as a condition of being able to protect our copyright, and then make it prohibitively expensive to do so. Unless and until the Copyright Office or Congress changes the rules for registration, most Web content will remain effectively unprotected by US copyright law. in January 2017, the NWU and three other national organizations of working writers submitted a petition for rulemaking to the Copyright Office, formally requesting that office to create group registration procedures for multiple short works by a single author first distributed electronically on multiple dates, or published in formats that might not fit the legal definition of “peridocials”, such as those that aren’t published on a regular schedule. Additional organizations of writers endorsed our petition in filings with the Copyright Office in November 2017. This is the first time in many years that such a broad coalition of writers’ organizations has made a joint formal request for action by the Copyright Office. But the Copyright Office has not yet begun the “rulemaking” process to change its regulations. This week, four of the organizations that endorsed the petition for rulemaking took it to Washington in person. It was the most diverse group of writers’ representatives to meet jointly with the Copyright Office in many years. We explained why the existing registration rules don’t work, or are prohibitively costly and time-consuming, for short-form writing published or distributed on Web sites, blogs, social media, or in many other formats. This isn’t a minor or secondary issue, or one that can be put off until after the Copyright Office has completed a comprehensive upgrade to its computer systems. We urged the Copyright Office to act on our petition sooner rather than later, by opening a rulemaking consultation to work out the details of new group registration procedures. The Copyright Office officials we met with made no firm commitments, but they listened and we think they heard the urgency of our call for action. (b) multiple written works by the same creator first published on multiple dates, regardless of whether they were published as contributions to periodicals. If your organization would like to endorse this petition, please contact the NWU.